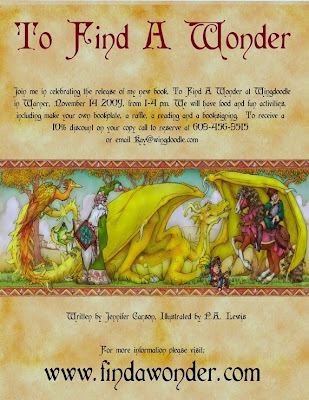 Please join us at Wingdoodle to celebrate the release of To Find A Wonder by Jennifer Carson on November 14, 2009. Jennifer Carson will be at Wingdoodle from 1-4pm for a book signing party. We are really excited about this and honored that she asked Wingdoodle to host this party. You can pre-0rder your book from Wingdoodle and get a 10% discount. Set aside time Saturday November 14th to stop into Wingdoodle and join the festivities. Wingdoodle is located at 19 E Main St. Warner, NH. Jennifer Carson lives in New Hampshire with her husband, four sons and many four legged friends. She grew up on a steady diet of Muppet movies, and renaissance fairies and would occasionally be caught reading under the blankets with a flashlight. Besides telling tales, and being an editor for Faerie Magazine, Jennifer likes to create fantasy creatures and characters and publishes her own sewing patterns. Her artwork and patterns can be seen online at thedragoncharmer.com. To Find A Wonder is her first published work of fiction.